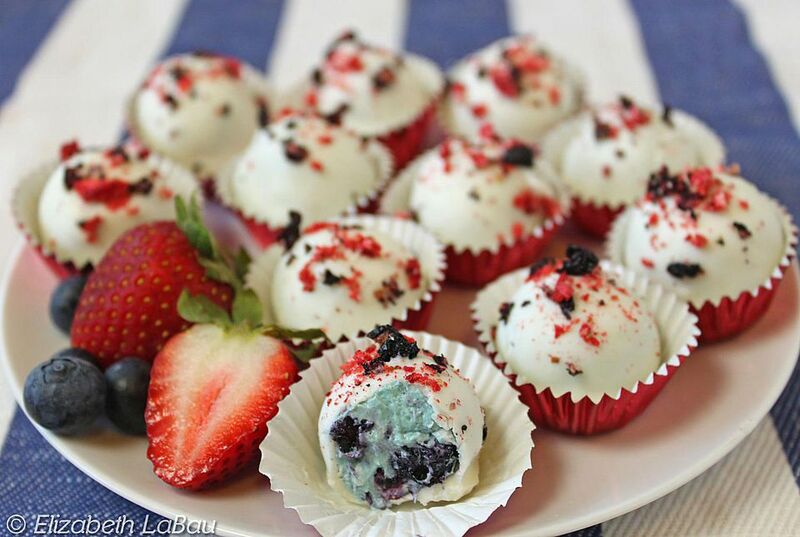 Blueberry preserves and dried strawberries give Double Berry Truffles a vibrant burst of berry flavor, as well as a beautiful red, white, and blue color scheme. These taste a lot like blueberry cheesecake! You can omit the blue food coloring (especially if you want to avoid having a blue mouth for the rest of the day!) but be aware that the truffle filling will be a dull purple-gray without any added coloring. I think the freeze-dried strawberries and blueberries on top give the truffles a wonderful crunchy texture, but if you can't find them, any dried berries or red and blue sprinkles will work nicely. I usually find my freeze-dried berries at Trader Joe's markets, and they are also available online. Melt 6 ounces of white chocolate (about 1 cup of chip-sized pieces) in the microwave or over a double boiler, and allow it to cool slightly. Place the softened cream cheese in a mixing bowl and beat on medium-high until smooth and creamy. Add the melted white chocolate and beat until smooth. Stir in the cookie crumbs, blueberry preserves, vanilla, and food coloring. Cover with plastic wrap and chill in the refrigerator for an hour, until the candy is firm enough to roll. Shape the mixture into small balls and place them on a baking sheet that is covered with aluminum foil. Refrigerate until the balls are quite firm, about 1 hour. Melt or temper the remaining 10 ounces of white chocolate. Finely chop the freeze-dried strawberries and blueberries, if you're using them. Dip the truffles in the white chocolate using dipping tools or two forks. Place the chocolate-coated truffles back on the baking sheet, and while the chocolate is still wet, top them with a sprinkling of the chopped fruit. Return the truffles to the refrigerator to set the chocolate. Store Double Berry Truffles in an airtight container in the refrigerator for up to two weeks, and allow them to come to room temperature before serving. Bananas Foster Truffles - Tastes Just Like the Real Thing!